A $2 million grant for improvements to the giant Keck Telescopes on Mauna Kea would allow astronomers to observe objects that are 100 times fainter than what they can currently see at the observatory. WAIMEA, Hawaii » A $2 million National Science Foundation grant for improvements to the giant Keck Telescopes on Mauna Kea could help astronomers confirm Albert Einstein's theory of relativity by allowing them to see how space and time are being warped by a black hole at the center of the Milky Way galaxy. It is also hoped the improvements also will detect planets around other stars. The upgrades to the interferometry of the telescopes will allow researchers to observe objects that are 100 times fainter than what they can currently see at the observatory and with 10 times more accuracy than by using one of the telescopes alone. 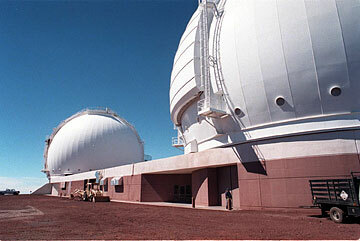 Keck consists of twin telescopes with 33-foot mirrors separated by 275 feet. Focusing the two telescopes on the same object and combining the light from them is called interferometry. The effect is like creating a single telescope with a 275-foot mirror. The improvements will make the observatory uniquely capable of "measuring the position, velocity and acceleration of stars near the massive black hole at the center of our own galaxy, allowing us to look for the distortions in space predicted by general relativity," said Peter Wizinowich, the observatory's senior scientist. In 1918, Einstein's theory of relativity led Austrian physicists Joseph Lense and Hans Thirring to the idea that a massive spinning body would distort space and time. The new grant might let astronomers see it happening. Black holes are enormously massive, with enormous gravity. Even light that falls into them cannot shine out again. They are also thought to be spinning, a theory that the new grant could confirm. Tremendous gravity and spin create "frame-dragging," Lense and Thirring theorized. Gravity in theory can contort the lines of space and time much the way a glass float ball stretches the strings of a net. And if the ball is spinning, it pulls the net with it. Taking a look at what really happens next to the Milky Way's black hole is "at the core of the project" at Keck, said project scientist James R. Graham, professor of astronomy at the University of California at Berkeley. The actual distortions in space-time are expected to be very small. Seeing them, even with new equipment, will be "difficult and challenging," Graham said. The new instruments will also make measurements of giant planets circling other stars. About 200 such planets, the size of Jupiter and bigger, have been detected from the wobble they cause in their parent stars. The new, precise measurements of the wobble will reveal the mass of each planet. Since NASA shelved plans for space-based instruments to study distant planets, Keck will be the only observatory in the world able to give precise measurements on them.